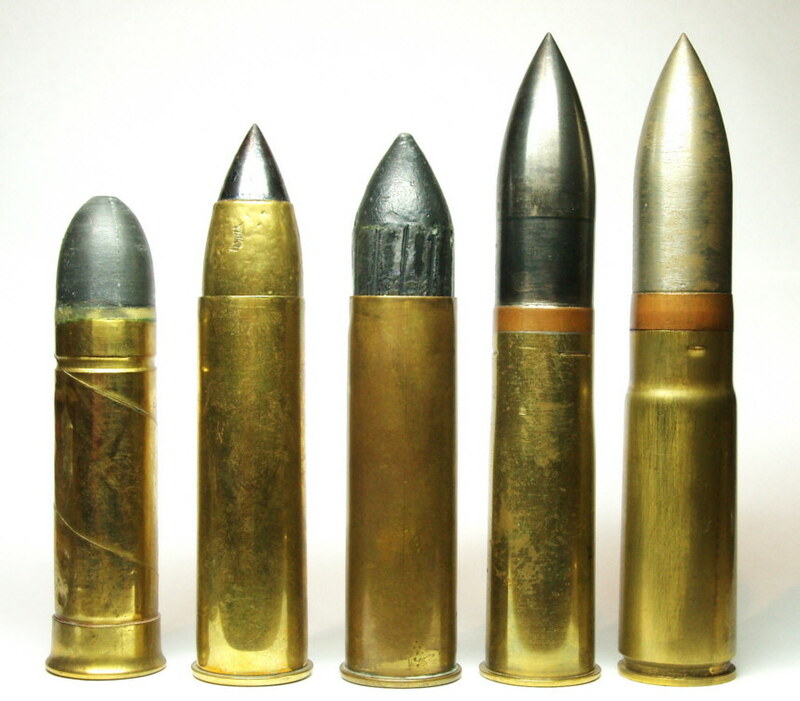 This class of ammunition has never been as popular as the 20mm rounds (see separate article). Perhaps a dozen rounds in this class can be considered really successful, in terms of being widely used. Several others were fully developed but saw little or no use. As before, this article will be concentrating on those which saw actual use - even if not much! The first cartridge shown is the rare 1 inch Gatling round (25x88R), in this case a replica of the French model made with a coiled brass rather than drawn brass case. US models come with drawn brass cases of different lengths (one slightly longer, one much shorter). This was the largest of the original Gatling series of rounds, and saw little use. Far more common is the 1 inch Nordenfelt (25x94R), which entered British naval service in 1881 in a manually-cranked, multi-barrel close-defence gun. This typically had a steel-cored bullet as shown, but lead bullet loadings were also known. This is easily confused with the third round, the 1 inch Aiming Tube, used for sub-calibre training. This used the same case as the Nordenfelt, but a lead bullet of a different shape, and was also often used with electric priming. Next come two rounds designed for automatic weapons: the Vickers 1 inch (25x87R) and the 25mm Revelli-FIAT (25x87). The Vickers was designed for an aircraft gun in 1914 but this saw no British service, being only made in Italy by Vickers-Terni. This saw limited service in some Italian aircraft (one picture shows one installed in a Caproni Ca.3 bomber) and was purchased by the Swedish navy in 1922 for arming some submarines; the only known official adoption. The Revelli-FIAT was inspired by the Vickers-Terni, but perhaps too closely as production was curtailed when Vickers threatened legal action over patent violations. The cartridge case was modified to a more modern, sharp-shouldered, rimless type, but the gun was magazine-fed (the Vickers was belt-fed). The gun was installed in a variety of Italian aircraft and was used in action in WW1, but was not popular due to the tendency of the HE shells to explode prematurely. Both the Vickers and Revelli-FIAT cartridges are uncommon. This period saw a marked increase in the size and performance of the cartridges in this class. The first to be developed was the 23mm Madsen, which used a 23x106 cartridge formed by necking-out and shortening the case of the popular 20x120 Madsen round; the guns were identical, except for the barrel. The idea was to trade velocity for high-explosive content to increase the effectiveness of the gun in its aircraft applications; the HE shell contained double the HE of the 20mm. The 23mm Madsen featured in various experimental installations, but probably never made it into service except reportedly in Argentina and – just possibly – in a couple of Hawk 75 planes bought by China. The cartridge is very rare. Another cartridge which was never formally adopted for service was the 23x122 for the French Hispano-Suiza HS 406 and 407 aircraft cannon, a big brother to the famous 20mm Hispano HS 404. This was very powerful, but was still being perfected in 1940. One fighter plane probably armed with this gun took off for an anti-tank mission during the Battle of France, but was shot down. In recent years this round has become fairly common. The USA made four attempts to produce a .90 inch aircraft gun around 1940, using three different cartridges. The T1 used a necked-down and shortened 1.1 inch case, the T2 and T3 a rebated rim case, and the T4 a 23x139SR semi-rimmed case shown here. The T4 is quite common, the others are exceptionally rare. The USSR now comes into the picture with the powerful 23mm VYa (Volkov-Yartsev, the designers) aircraft cannon. The 23x152B cartridge had a brass case, unlike the postwar AA variant for the ZU gun, and is much less common. Brass cases with postwar dates (like the one shown) were used for subcalibre training. The Swiss 24x139 cartridge was used in two 24mm Tb41 self-loading guns, one a light anti-tank gun, the other for arming light AFVs. It is difficult to find outside Switzerland. From France came two different 25mm Hotchkiss guns and cartridges: the 25x163 for the Mle 1938 automatic AA gun (adopted by the Japanese Navy as the 25mm Type 96) and the 25x194R for the Mle 1934 manually- loaded anti-tank/light tank gun. The AP loadings for these rounds are unusual in that they use a jacketed projectile, just like a big AP rifle bullet. Both of these cartridges are fairly common. Next came the 25.4mm Vickers, which used a 25x189 cartridge. This is described and illustrated in a separate article on this site so no more will be said here, except that it only appears to have been used in the Vickers-built Argentinian training cruiser La Argentina. It is exceptionally rare. The Hotchkiss 25x194R case was indirectly used as the basis for the German 28/20 Gerlich squeezebore round (28x187R) used in the PzB.41 anti-tank gun. Original examples are rare: the magnesium projectile tip tended to corrode so most encountered now (like the one in the photograph) have a replica tip. Next comes the 25mm Bofors, which was introduced in 1932. The initial m/32 model fired a 25x205R round, but a later m/38 version fired a modified 25x187R. The gun seems to have seen little use except for its purchase by the USSR, which modified the case yet again (to a slightly longer but slimmer 25x218R) and put it into service during WW2 as the M40 naval AA gun. Attention now switches to the USA and the 1.1 inch naval AA gun, made only in a four-barrel mounting. The big 28x199SR cartridge was powerful, but the gun was slow-firing and required careful maintenance, so the 40mm Bofors was preferred during WW2. The one in the photo has a replica projectile. For several decades after WW2, the Soviet Union monopolised new service developments in this calibre range. First was the 23x115 cartridge introduced in the NS-23 aircraft gun which emerged at the end of the war. It was soon replaced by the faster-firing NR-23, then the even faster AM-23, before the famous twin-barrel GSh-23 made its appearance in the late 1950s. In the 1970s, the cartridge was retained for the GSh-6-23 six-barrel rotary gun. All of these were designed as aircraft weapons. The ammunition is common. The 23mm ZU AA gun used basically the same 23x152B case as the VYa, but made of steel, with a different primer and different loadings so it is not interchangeable. It is now very easy to find. Next comes the 25x218 naval AA gun cartridge, a rimless version of the 25x218R M40. The ammunition is a lot more common than it used to be. One oddity is the 23x260 for the Soviet Rikhter R-23 reverse-loading aircraft revolver cannon of the early 1960s. The cartridge looks like a length of plumbing pipe, with the projectiles concealed within it and a tapering base without a rim or extractor groove. It did see operational service in some Tu-22 bombers, but the ammunition is exceptionally rare and is not shown here. Attention now switches to the West. 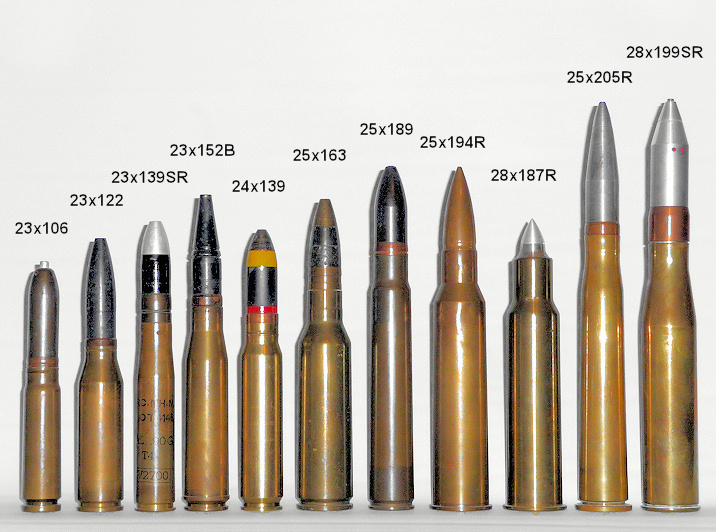 The most successful of all of the 25mm rounds, the 25x137 Oerlikon, is a standard NATO round, used in a variety of guns, including the Oerlikon KBA, M242 Bushmaster Chain Gun, GAU-12/U five-barrel rotary and the new GAU-22/A four-barrel version for the F-35 fighter, and the Nexter 25M811. Ammunition for this is of course more common than for any other in this calibre, with a wide range of different loadings. The 25x137's big brother is the lengthened 25x180 (commonly referred to as the 25x184), used in the Oerlikon KBB gun. This has been far less successful (only used in a CIWS adopted by the Turkish navy), but is still not too hard for collectors to find. In between them in this photo is the new Chinese 25x183B Type 95 (one source gives the case length as 178mm), introduced in 1995 in a powerful army AA gun. This is found in a twin towed mounting and a four-gun self-propelled AA vehicle. Actual examples are unavailable to collectors; the picture shows a replica. Next comes the 27x145B Mauser, designed for the BK27 aircraft revolver cannon which is in widespread European service (including in Tornados, Gripens and Typhoons). The gun has been adopted by the German Navy in the remotely-controlled MLG-27 defensive mounting. The 27x173 shown next to it is an oddity, in that it is not designed for an automatic cannon but for the Mauser SCORE sub-calibre insert, used in tank guns for low-cost training. It is very hard to find. Finally, some experimental rounds: the USA attempted to develop a very advanced 25mm aircraft gun, the GAU-7/A rotary, in the late 1960s. This had a combustible case and used a telescoped layout, with the projectile buried within the case, but technical problems defeated the project. The projectile (shown here next to the case) is quite common, the case much less so. The 25x116B is essentially a necked-down 30x113B case and was developed for the Oerlikon 251 RK revolver cannon (which was also made in 20mm and 30mm calibres). The 26x130 is for the 26mm Colt AFV gun, while the 27x70B was used in a version of the M61 6-barrel aircraft gun. There was also a higher-velocity 27x96B version firing lighter projectiles. All of these three are rare. 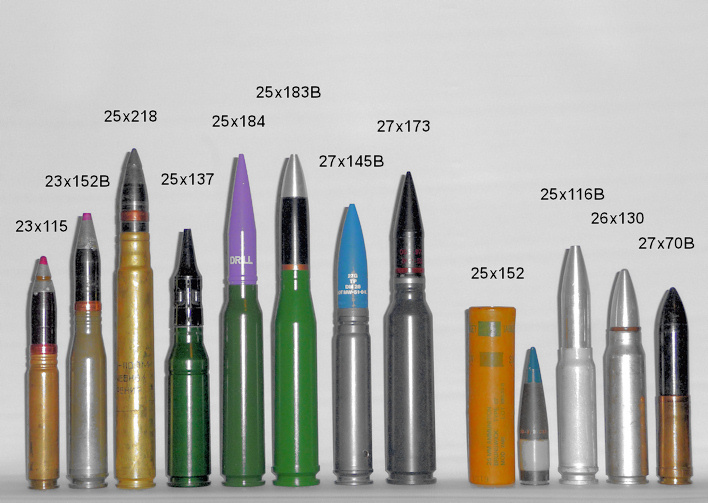 There are, of course, far more 23-28mm experimental rounds than are shown here.